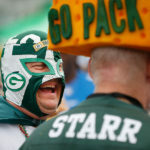 Photos from Green Bay Packers NFL Football Training Camp. NFL football training camps are in full swing around the country with the start of the 2012 NFL season just a few weeks away. Here are a few of my favorite photos from covering the start of the Green Bay Packers NFL football training camp in Green Bay, Wisconsin in the shadows of Lambeau Field. One of the more visually friendly aspects of Packers training camp is that local youth turn out in force with their bikes so that the players can ride them from the stadium to the practice field. One thing I learned this year during camp is always keep an eye on Clay Matthews when he take drink of water, he has a special knack for always turing that into a photo opportunity. 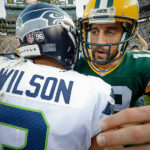 The Packers went 15-1 last year, but go knocked out of the Super Bowl hunt by the eventual Super Bowl Champ, the New York Giants, in their first playoff game. Hopefully the Packers can put together another great season and end up playing for the Lombardi Trophy in New Orleans in February. 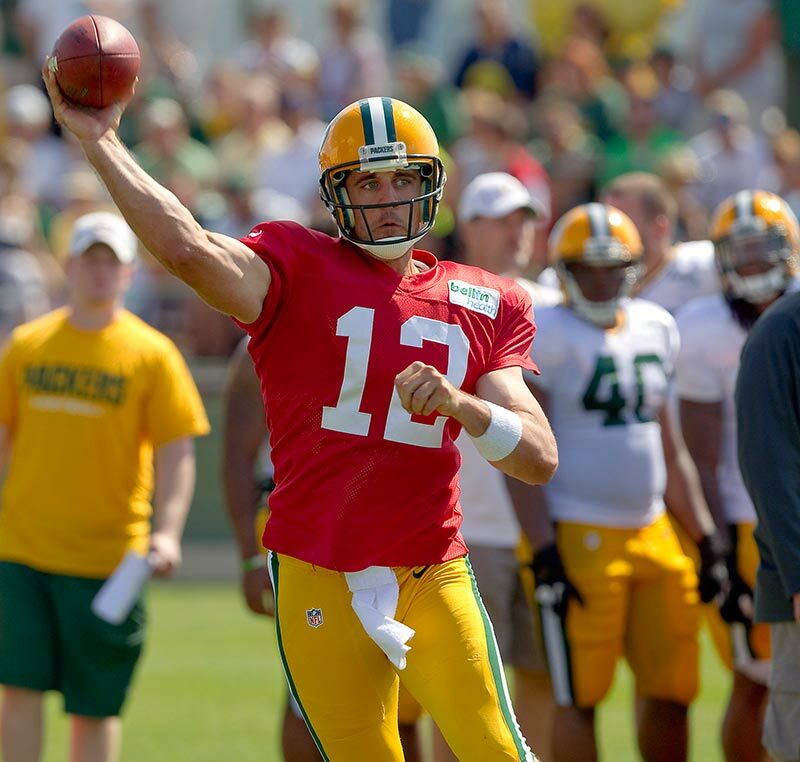 Green Bay Packers quarterback Aaron Rodgers (12) throws during Green Bay Packers NFL football training camp Tuesday, July. 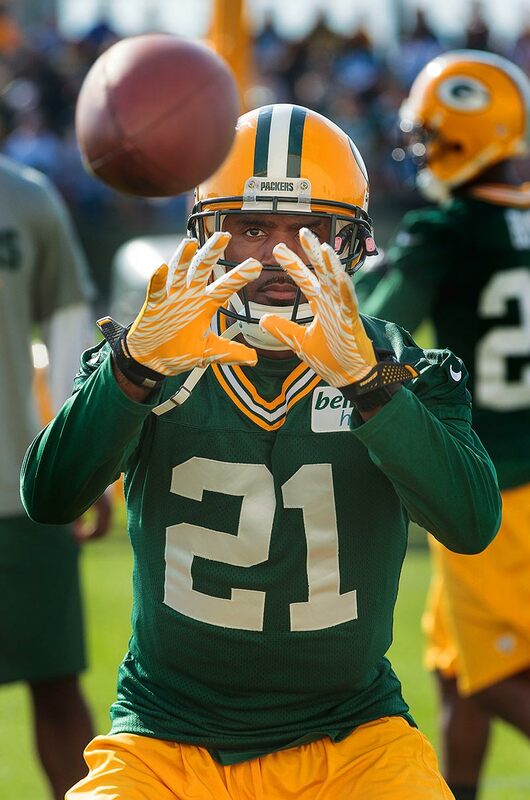 31, 2012, in Green Bay, Wis.
Green Bay Packers defensive back Charles Woodson (21) catches a ball during Green Bay Packers NFL football training camp Thursday, July. 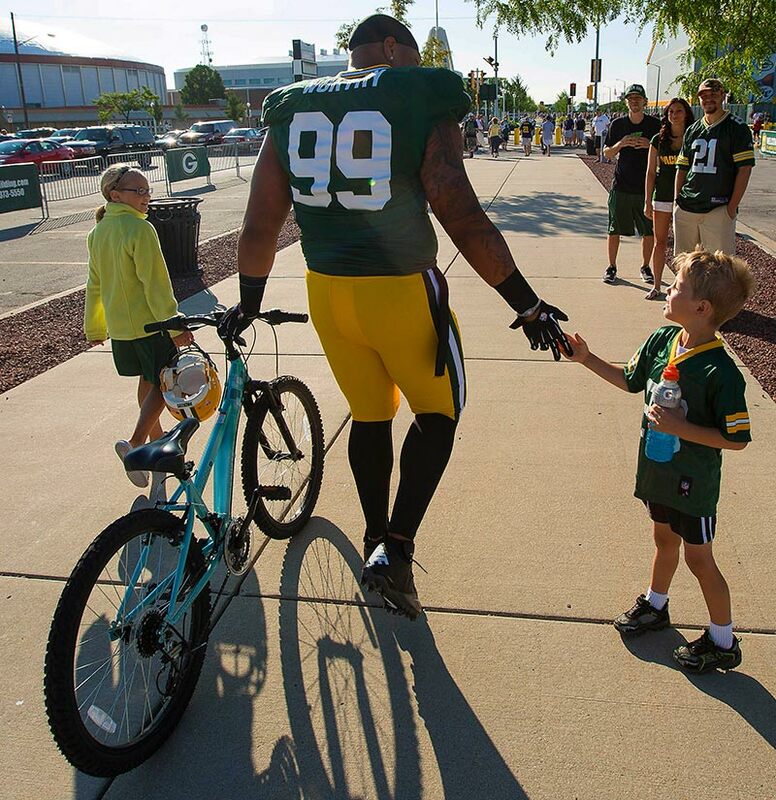 26, 2012, in Green Bay, Wis.
Green Bay Packers defensive end Mike Daniels (76) carries a young boys bike after it was to small for him to ride before NFL football training camp Saturday, July. 28, 2012, in Green Bay, Wis.
Green Bay Packers defensive end Jerel Worthy (99) low fives a young fan at NFL football training camp Saturday, July. 28, 2012, in Green Bay, Wis.
With a young fan running along side him Green Bay Packers quarterback B.J. Coleman (9) rides a bike before NFL football training camp Tuesday, July. 31, 2012, in Green Bay, Wis.
Green Bay Packers defensive back Micah Pellerin (32) eyes up if a young childs bike is big enough to ride before NFL football training camp Saturday, July. 28, 2012, in Green Bay, Wis.
Green Bay Packers offensive guard Evan Dietrich-Smith (62) rides a bike to Green Bay Packers NFL football training camp Tuesday, July. 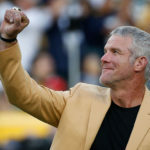 31, 2012, in Green Bay. 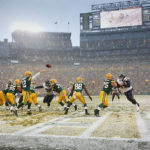 Green Bay Packers nose tackle B.J. Raji (90) talks with defensive line coach Mike Trgovac during Green Bay Packers NFL football training camp Thursday, July. 26, 2012, in Green Bay, Wis.
Green Bay Packers defensive end Jerel Worthy (99) signs an autograph before Green Bay Packers NFL football training camp Tuesday, July. 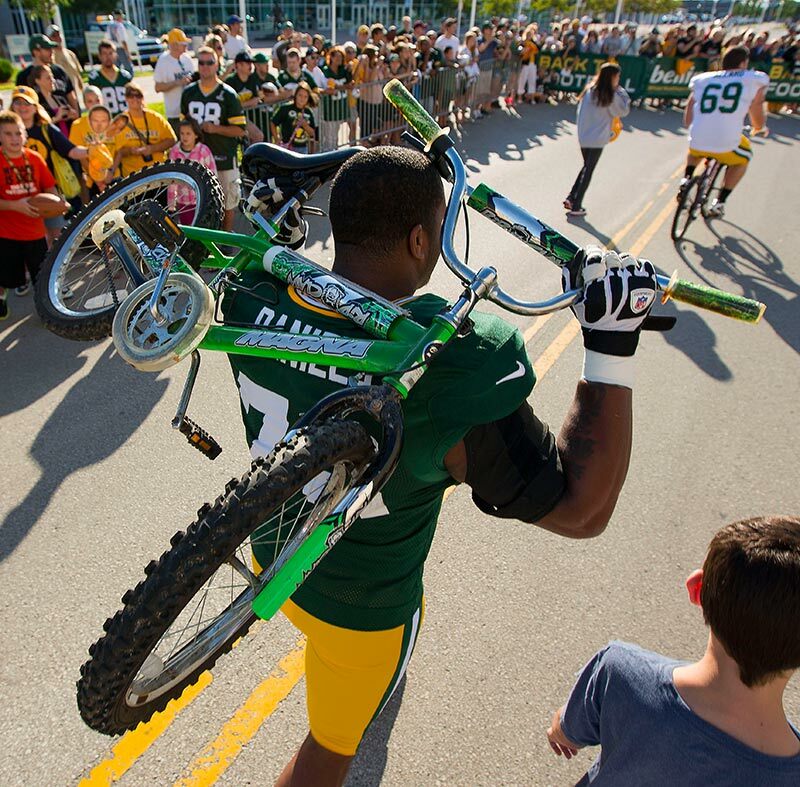 31, 2012, in Green Bay, Wis.
Green Bay Packers linebacker Nick Perry (53) high fives fans as he rides a bike to Green Bay Packers NFL football training camp Tuesday, July. 31, 2012, in Green Bay, Wis.
Green Bay Packers linebacker Nick Perry (53) catches a ball during NFL football training camp Saturday, July. 28, 2012, in Green Bay, Wis.
Green Bay Packers linebacker Clay Matthews (52), right, guards wide receiver Randall Cobb (18) during Green Bay Packers NFL football training camp Thursday, July. 26, 2012, in Green Bay. Green Bay Packers defensive end C.J. Wilson (98) stretches as Green Bay Packers defensive end Jerel Worthy (99) looks on during Green Bay Packers NFL football training camp Tuesday, July. 31, 2012, in Green Bay, Wis.
Green Bay Packers quarterbacks coach Ben McAdoo talks with (l-r) center Jeff Saturday (63), quarterback Aaron Rodgers (12) and offensive guard T.J. Lang (70) during NFL football training camp Saturday, July. 28, 2012, in Green Bay, Wis.
Green Bay Packers wide receiver Greg Jennings (85) talk with wide receivers coach Edgar Bennett during Green Bay Packers NFL football training camp Thursday, July. 26, 2012, in Green Bay, Wis.
Green Bay Packers defensive line coach Mike Trogvac works with Green Bay Packers nose tackle B.J. Raji (90) during Green Bay Packers NFL football training camp Tuesday, July. 31, 2012, in Green Bay, Wis.
Green Bay Packers linebacker Nick Perry (53) chases after a ball during NFL football training camp Saturday, July. 28, 2012, in Green Bay, Wis.
Green Bay Packers defensive back Jarrett Bush (24) works on a drill on knocking the ball out of a quarterbacks hands during Green Bay Packers NFL football training camp Tuesday, July. 31, 2012, in Green Bay, Wis.
Head Coach Mike McCarthy talks to Green Bay Packers quarterback B.J. 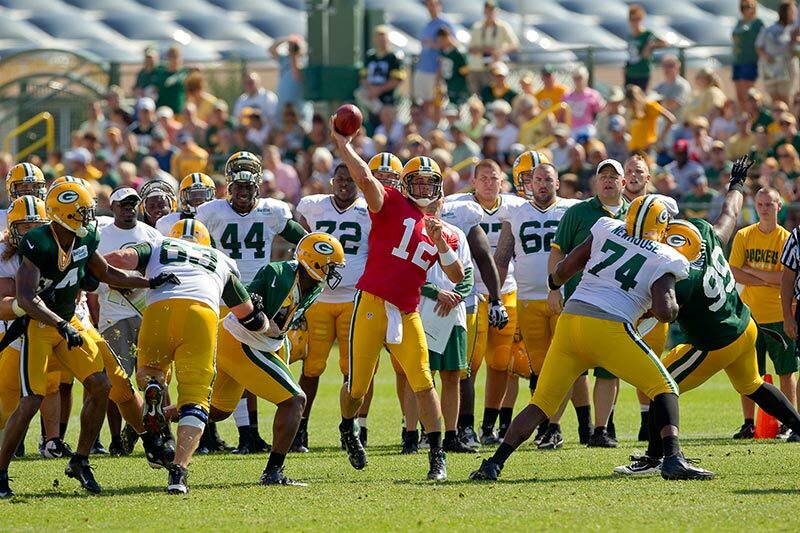 Coleman (9) during Green Bay Packers NFL football training camp Thursday, July. 26, 2012, in Green Bay, Wis.
Outside linebackers coach Kevin Greene works with Green Bay Packers linebacker Clay Matthews (52) during Green Bay Packers NFL football training camp Tuesday, July. 31, 2012, in Green Bay, Wis.
Green Bay Packers linebacker Desmond Bishop (55) does pushup during NFL football training camp Saturday, July. 28, 2012, in Green Bay, Wis.
Green Bay Packers linebacker Nick Perry (53) takes a drink of water during Green Bay Packers NFL football training camp Thursday, July. 26, 2012, in Green Bay, Wis.
Green Bay Packers wide receiver Randall Cobb (18) gets past defensive back Sam Shields (37) and cornerback Casey Hayward (29) during NFL football training camp Saturday, July. 28, 2012, in Green Bay, Wis.
Green Bay Packers defensive back Jarrett Bush (24) pulls in a pass during Green Bay Packers NFL football training camp Thursday, July. 26, 2012, in Green Bay, Wis.
Green Bay Packers wide receiver Randall Cobb (18) runs over Green Bay Packers defensive back Tramon Williams (38) during Green Bay Packers NFL football training camp Tuesday, July. 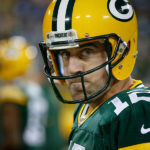 31, 2012, in Green Bay, Wis.
Green Bay Packers quarterback Aaron Rodgers (12) keeps an eye on thing during NFL football training camp Saturday, July. 28, 2012, in Green Bay, Wis.
Green Bay Packers linebacker Terrell Manning (56) pulls in a pass during Green Bay Packers NFL football training camp Thursday, July. 26, 2012, in Green Bay, Wis.
Green Bay Packers linebacker Nick Perry (53) smiles as he talks with linebacker Clay Matthews during Green Bay Packers NFL football training camp Tuesday, July. 31, 2012, in Green Bay, Wis.
Green Bay Packers quarterback Aaron Rodgers (12) tries to get away from the defensive pressure of defensive end Jerel Worthy (99) during NFL football training camp Saturday, July. 28, 2012, in Green Bay, Wis.
Green Bay Packers linebacker Clay Matthews (52) s[rays water on his face to cool down during Green Bay Packers NFL football training camp Tuesday, July. 31, 2012, in Green Bay, Wis.
Green Bay Packers linebacker Clay Matthews (52) sprays water on his face during NFL football training camp Saturday, July. 28, 2012, in Green Bay, Wis.
Green Bay Packers linebacker Clay Matthews (52) signs autographs after NFL football training camp Saturday, July. 28, 2012, in Green Bay, Wis.
Young Packers fans wait with their bikes to see if a Packers player with pick theirs to ride after practice during NFL football training camp Tuesday, July. 31, 2012, in Green Bay, Wi.